Nothing hurts more than the truth, and that adage goes far at explaining why the Liberals self-imploded upon being confronted by their hideous reflection in the NPC avatar. 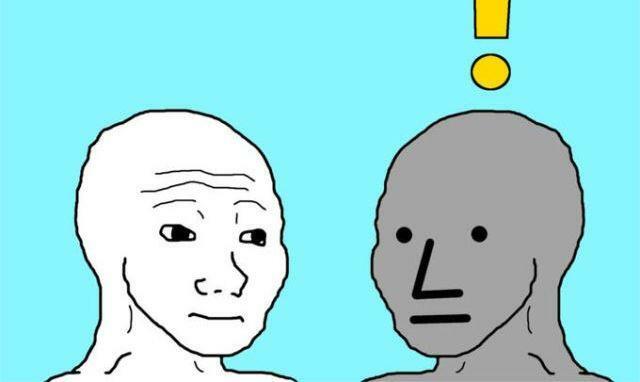 First conjured to life on 4Chan and Reddit message boards, the NPC meme, represented by a crudely sketched stick figure that comes in a variety of persona, was designed as a method for portraying those well-known character traits the right has come to associate with their leftist alter-ego. The term ‘social justice warrior,’ while loaded with mockery, derision and cynical overtones, failed to nail the dark heart of the matter. What was needed was a meme that exposed the left’s superiority complex that is so out of control it lets them believe that by just getting out of bed and showing up for a protest legitimizes their cause and anything that follows. Thus, the right, which still enjoys the weapon of comic genius combined with computer prowess, supplanted the SJW tag with an innocuous-looking meme that eventually burrowed its way under the fleshy underbelly of the left until it was writhing on the pavement in painful spasmodic convulsions. The arrow was deadly because it carried the ultimate poison known as truth. 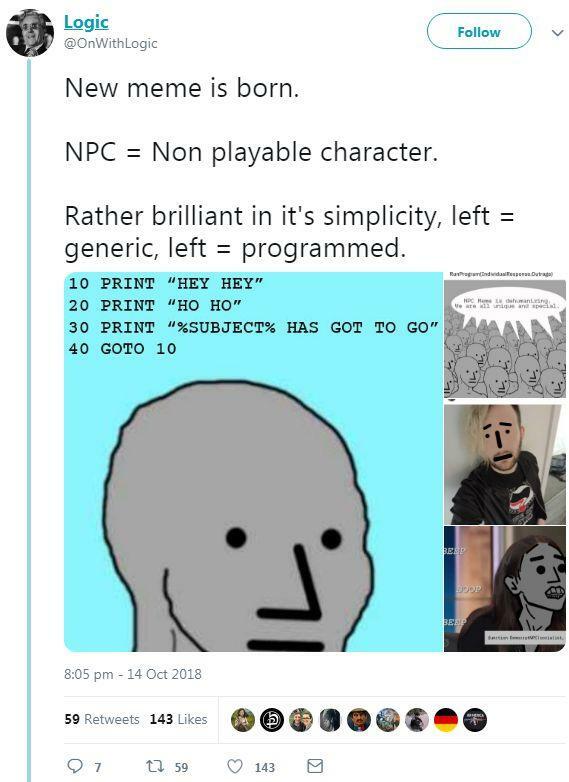 For the uninitiated, NPC stands for ‘nonplayable character’ or ‘nonplayer character,’ a term borrowed from the gaming community that describes those characters in video games whose only pre-programmed function is to wander about the screen eliciting generic, robotic remarks. Sound familiar? This meme successfully captured the essence of the left to such a degree that it forced Twitter to go on another search and destroy mission, suspending hundreds of accounts thought to be associated with the army of dangerous stick figures. Although every organization, political or otherwise, can be accused of operating to some degree inside of an echo chamber, the groupthink that has taken over the Liberal brain is disturbingly reminiscent of that which dominated past totalitarian movements: a high level of emotion and even violence substituting for critical thinking; refusal to debate political ideology with its ‘enemy’; religious-like belief in the sanctity of its endeavor. This groupthink – minus the ‘think’ – is even willing to carry out the most heinous commands of its leaders with dogged devotion. Democrat darling Senator Maxine Waters, for example, harangued a crowd of her supporters to “get out and create a crowd, and you push back on” Trump officials whenever they are seen in public places, like restaurants, shopping centers and even gasoline stations. Needless to say, this is the very definition of madness, and it speaks volumes about the people who applaud such lunacy since, I am guessing, it will eventually be the Liberals who are hounded in public by Republicans when they try to enjoy a dinner with their family. Two can play such a fool’s game, as I argued on Patrick Henningsen's Sunday Wire Show. The NPC meme provides a mirror image of the Liberal in that they, or at least the ‘they’ who has been allowed to hijack the party, cannot articulate their position beyond the scripted ‘reality’ they have duly received via the corporate-owned, government-saddled mainstream media, late-night standup buffoons (the Colbert, Kimmel and Oliver stooge show), and the duplicitous Democratic leaders who have convinced both themselves and their constituents that Russia is the reason yet another corrupt Clinton is not desecrating the Oval Office. There are intelligent Liberals of course. But they’ve been pushed out of the spotlight, silenced by the screaming horde running on autopilot that poorly substitutes for cognitive life forms. In the meantime, American society must deal with a brat pack of withering snowflakes whose sense of political duty is so steeped in self-righteousness, hypocrisy and outright thuggery that college campuses are no longer the domain for advanced learning, but rather incubators for breeding brainwashed automatons who would rather let Antifa lead them astray then let Anne Coulter give a talk on campus. Similar to the religious inquisitors of the Middle Ages, these individuals consider it below them to hear the arguments of their opponents lest their soft brains be exposed to some blasphemous idea.Will these mentally stunted students be given a life-time supply of diapers with their diplomas? These miscreants, who rank themselves as human-loving activists, are really nothing more than part of a Soros-paid rent-a-mob who brandish freshly printed cookie-cutter placards and get paid to stir up trouble at every opportunity. There is no sense of a grassroots undercurrent that is guiding this rabble along its tortuous path. That much was plainly seen at the Senate hearings for Brett Kavanuagh when Ana Maria Archila confronted Arizona Republican Sen. Jeff Flake in an elevator, ranting and raving that Flake was helping to put someone “who actually violated a woman” (the lack of evidence does not stop the modern Liberal from hurling slanderous mud balls) on the Supreme Court. Turns out that Archila is not your average lunatic; indeed, she is co-executive director at the Soros-funded Center for Popular Democracy (CPD). And perhaps it was just coincidence too that a CNN news crew just happened to be on the spot to catch all the action. Does any of this Liberal craziness pass for ‘democracy in action?’ Hardly. In fact, it is symptomatic of a nation that some might argue is healthy and energetic only because it is writhing and screaming on the floor with convulsions. Much of this is due to the fear and loathing that the Liberals have injected into the nation’s political buttocks ever since they lost in 2016. Similar to the aftermath of 9/11 when any idea could be superimposed onto the national psyche, which had been greatly traumatized and primed for mischief, the same could be said for the Liberals, who are willing to accept any rubbish just so it helps them defeat the Republicans. Victory for victory’s sake is not a political program, but a transparent power grab that enough intelligent Democrats should be able to see through. 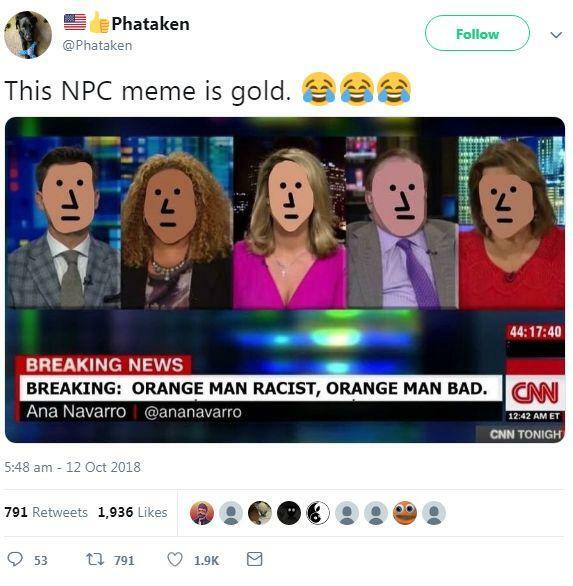 The fact that they cannot is exactly why Liberals were awarded the NPC avatar, which will not be going away anytime soon. If the meme fits, wear it. In any case, I’ll be voting for the NPC meme as ‘Person of the Year 2018,’ that much is for sure.